Moist deciduous, coniferous and mixed forests with stumps and logs for ground cover; cedar, tamarack, and black spruce swamps, bogs with spruce and fir. This is one of the smallest voles found in Minnesota. Adults have a stocky build. They may be 4½″ to 6¾″ long, including the tail, and weigh ¼ to 1½ ounces, but average just 5¼″ long and ⅞ ounce. Males and females are similar in size. Females have 8 mammae. The coat (pelage) is dark gray above with a broad, chestnut-brown stripe down the middle of the head and back. In the summer it is relatively short and coarse. In the winter it is long, dense, and lighter in color. The belly is gray to creamy white. Juveniles	are	darker	than	adults. The legs are short. The feet are creamy white or buff. The tail is short, 1″ to 2⅜″ long, slender, and sharply bicolored. The head is gray on the sides and face. The snout is short. The eyes are small. The ears are brown and short. The mouth has 16 teeth. The upper incisors are not grooved. The molars have high crowns and angular cusps. Lemmings are larger and have shorter tails. On other voles the pelage is not bicolored. They are opportunistic feeders consuming mostly plant matter. Their diet changes with the season. In the spring they eat mostly young shoots and leaf petioles. In the summer they also eat berries. In the fall they also eat nuts and seeds. In the winter they eat seeds, roots, bark of young trees and shrubs, and food stored in their nests. Throughout the year they also eat roots, insects, snails, fungi, and lichens. Breeding takes place from May to September. There may be 2 to 6 litters in a year. The nest is located usually under a log, tree root, or other shelter, sometimes in a burrow created by a mole or other small mammal. Gestation lasts 17 to 19 days. The female has 3 to 8, usually 4 to 6 offspring. The young are born naked and blind. They remain in the nest less than three weeks. They reach sexual maturity at 2 to 4 months of age. They are active both during the day and at night, but more often at night. They forage mostly on the ground but also in trees. When on the ground they use runways of shrews, moles, or other small mammals. They usually hop rather than run. They are solitary and do not form colonies or pair bonds. Sources: 15, 24, 29, 76. 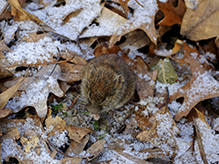 Common Gapper’s red-backed vole (Myodes gapperi gapperi) is found in north-central and northeast Minnesota. 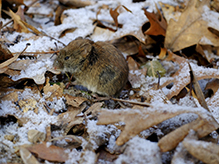 Loring’s red-backed vole (Myodes gapperi loringi) is found in the remaining forested areas of the state. A very common Minnesota vole, but a species that is uncommonly observed wandering paved footpaths. I had to photograph this very young and very, very wet (after the morning's severe rain storm), and much disoriented redback vole. Photographed at the Rydell NWR, Minnesota (20 August 2010). Go here to learn more about this interesting species: http://www.mnh.si.edu/mna/image_info.cfm?species_id=46. Photographed at the Concordia Language Villages, Bemidji, Minnesota (07 September 2010).